Let's begin by saying that I have been very happy with this series since the adjectiveless X-Men series rebooted a two months ago. Brian Wood, who had a promising, but brief run on the book prior to the relaunch, has been giving me a style X-Men book that I have been sorely missing for a very long time. It has a classic feel, without feeling dated; a modern take on Clarmontian model, quite similar to what Rick Remender has been producing on Uncanny Avengers. The third issue concludes the opening arc in a somewhat abrupt fashion. Not that I need a long, drawn out story - in fact, a three-parter is quite welcome in this era of decompression and writing for the trade paperback collection. More than likely, this arc is probably just the opening chapter of a bigger story that Wood has planned for the book. Also, next month kicks off a two month crossover event that includes this book, so some concession had to be made for that. What continues to win me over with X-Men is Wood's handling of the main cast. His renditions of Storm, Rogue, Kitty Pryde, and Jubilee are particularly strong and very familiar. 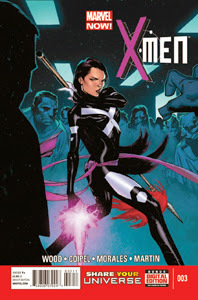 He has written Psylocke before in the previous volume, but she has yet to really have a presence under his pen. Rachel Summers hasn't really leapt off the page yet, but through her dialogue with Sublime, it is obvious that the writer has plans for her. Brian Wood has been able to recapture the core aspects of most of the cast that has been missing for a very long time. His take on Storm, here and in the previous volume, is the best handling of the mutant leader in decades. Too long Ororo Munroe has been cast as either supporting player to Cyclops or Wolverine, or simply the wife of the Black Panther. Wood has made her a leader again, and one that is not afraid to make the tough calls. Similarly, the Rogue presented in these pages is the version that has been missing every since Chris Claremont began messing with her powers in 2000. While I can completely understand some criticism about regressing her back to the brawler she was back in the '80s and '90s, it is at least an identity that most long time readers will find recognizable in the character. This has been sorely lacking for Rogue, outside of some very excellent handling by Mike Carey in X-Men Legacy a few years back. Of course, I cannot conclude this review without mentioning Olivier Coipel's elegant pencils. This adds another layer of nostalgia, given that his work reminds me of a mixing of styles from legendary X-Men artists Marc Silvestri and Jim Lee. While some of the storytelling can get a little confusing during the action sequences, his work is still a joy to look at. Overall, I'm still quite happy with X-Men. This issue may not have had the pop of the previous two, but Brian Wood and Olivier Coipel continue to produce a fun and exciting book that includes a healthy dose of the familiar. While previous takes, such as Matt Fraction's run on Uncanny X-Men, only gleam the surface of these characters, Wood has been able to mine their recognizable cores. The result has been a very satisfying comic book.